A Catalina Island ferry is the most common way to make the 26-mile trip to Catalina Island from the Los Angeles mainland. Your destination, Santa Catalina Island, is part Los Angeles County with law enforcement provided by the Los Angeles County Sheriff’s Department. Avalon, the island’s only municipality, is governed by its own city council. Catalina Island has been a favorite tourist destination for day trips and getaways for years. Avalon offers plenty to see and do but getting around by golf cart and seeing more of the scenic island environment makes for a memorable trip. Of course, private boats can dock in the Avalon Harbor and you can fly to the island via Island Express helicopter. Private pilots can fly into Airport in the Sky and take a shuttle from there into town. But most people go to Catalina Island by ferry and you'll need to know a few important things about the trip. Catalina Ferries are high-speed catamarans and mono-hulled boats with most service provided by two companies. You can catch a Catalina ferry from several locations. Long Beach - Catalina Express boats leave daily to Avalon from Catalina Landing in downtown Long Beach. The location has plenty of nearby paid parking. The trip takes an hour. San Pedro - Catalina Express goes from San Pedro to Avalon or Two Harbors. Their schedule varies by season, and they don't run every day on the off-season. The departure point is Berth 95 at the Sea/Air terminal, near the cruise ship terminals. Compared to the trip to Avalon from Long Beach, this boat takes about half an hour longer because of a long, slow, no-wake zone getting out of the harbor. Newport Beach - The Catalina Flyer makes one trip a day to Avalon from Newport Beach (Orange County). It leaves Newport Beach in the morning and returns in the late afternoon. 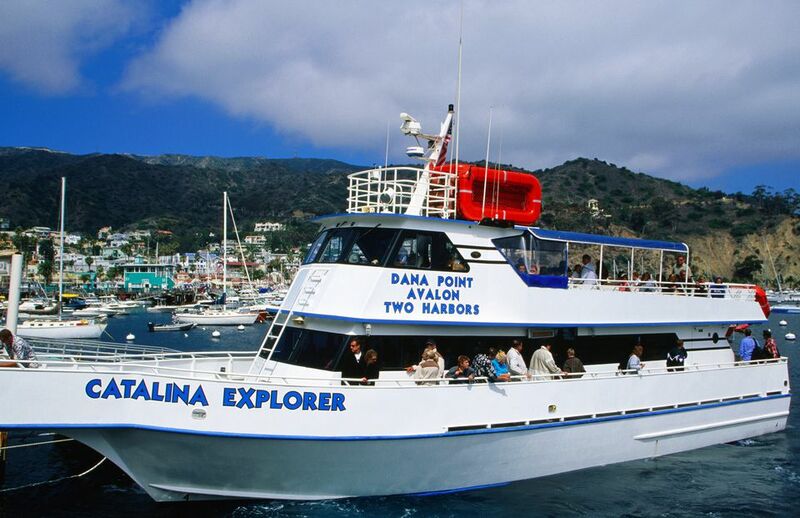 Dana Point - Catalina Express runs at least one ferry per week between Avalon and Dana Point in southern Orange County. The Dana Point ferry is the closest one to Catalina Island from San Diego. These tips apply to all the Catalina Island ferry companies, although baggage policies may vary slightly. Check Prices and Discounts. Taking a ferry to Catalina isn't inexpensive. A round trip can run up to $75. You may be able to save money by booking a hotel/ferry package. Check Catalina hotel websites to see what's available and look at the Catalina Island Chamber of Commerce as they list some package discounts. Also, check Groupon for some time-limited discounts. Some of the ferry companies, like the Catalina Flyer, offer online discounts shown on their main page. Reserve your space early. At busy times, ferry seats sell out quickly. Prepare for Travel to the Terminal. If you're flying into one of the local airports and need to get a shuttle to the Long Beach ferry terminal, you may be asked for the terminal zip code which is 90802. Taxi service is also available. Go Early on the Day of Departure. Be sure to bring your Catalina ferry reservation number with you. Get to the ferry terminal early. Check in at least 30 minutes ahead of time (an hour is better). If you're later than 15 minutes before departure, you may find your reservation canceled as a no-show. Dress for Sailing. Soft-soled shoes with tread on the bottom will help you get around the boat without slipping, especially on the ramps. It can get windy out on the water so take a jacket with you. Prepare for Motion Sickness. If you are prone to motion sickness, bring your favorite remedy. Some use a "Relief Band" which is a drug-free, FDA cleared wearable technology for the treatment of nausea associated with motion sickness. Seasickness pills and patches also help but can leave you drowsy when you arrive. On the positive side, the crossing is short, no more than an hour and a half, which helps the motion sickness prone. Know Dog Rules. You can bring your dog with you but they must wear a muzzle and be leashed. Or, smaller dogs can be enclosed in a pet carrier. Each passenger can bring two pieces of luggage, no larger than 21 × 24 x 36 inches and be weighing no more than 70 pounds each. One fold-up child's stroller is allowed free of charge, but you'll have to stow it in the baggage compartment. Bicycles, jogger strollers, children's wagons, surfboards and some other large items are allowed on a space-available basis, but there may be a small extra charge. Tandem bikes and kayaks are not allowed. Lots of potentially dangerous items are not allowed on the Catalina ferry. The ones that might affect you—especially if you plan to go camping—are butane cylinders, camp stove fuel, charcoal, firewood, fireworks, and matches. If you're unsure about anything else, review the Catalina Express Baggage Restrictions page and Catalina Flyer website information. Or, call and ask.